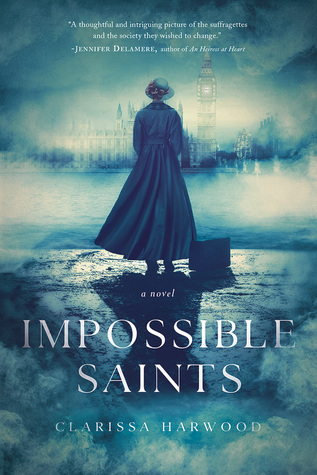 Set in England in 1907, Impossible Saints is a novel that burns as brightly as the suffrage movement it depicts, with the emotional resonance of Tracy Chevalier and Jennifer Robson. Escaping the constraints of life as a village schoolmistress, Lilia Brooke bursts into London and into Paul Harris’s orderly life, shattering his belief that women are gentle creatures who need protection. Lilia wants to change women’s lives by advocating for the vote, free unions, and contraception. Paul, an Anglican priest, has a big ambition of his own: to become the youngest dean of St. John’s Cathedral. Lilia doesn’t believe in God, but she’s attracted to Paul’s intellect, ethics, and dazzling smile. As Lilia finds her calling in the militant Women’s Social and Political Union, Paul is increasingly driven to rise in the church. They can’t deny their attraction, but they know they don’t belong in each other’s worlds. Lilia would rather destroy property and serve time in prison than see her spirit destroyed and imprisoned by marriage to a clergyman, while Paul wants nothing more than to settle down and keep Lilia out of harm’s way. Paul and Lilia must reach their breaking points before they can decide whether their love is worth fighting for. I love historical fiction novels that focus on women’s history, especially the women’s suffrage movement. If you can believe it, I have met people who had no idea that women were ever prohibited from voting–or how hard women fought to gain that right. Clarissa Harwood’s novel, Impossible Saints, is a passionate portrayal of the internal and external conflicts and ideological forces that women wrestled with in their day-to-day lives during the suffrage movement. Check out the rich archival holdings on the suffrage movement in the UK’s National Archives. This historical novel is a thought-provoking slow-burn romance. The reader is steeped in the ruminations and internal-struggles of the female and male protagonists. It’s the best kind of character-driven novel and follows the Downton Abbey-esque friendship and courtship of the MCs through the suffrage movement in England. Imagine the gripping tension that is created when a clergyman falls for a militant suffragist! While readers may be entertained by the idea that both characters are on opposite ends of the ideological spectrum, it’s the middle-ground negotiated between the two protagonists in the novel that makes the story so compelling. Lilia, the female protagonist, is tough as nails and dedicated to her cause. Her transformation from defiant school mistress to suffragette is vividly depicted; I loved how the author went into the nitty-gritty details of what suffragettes went through (in pickets, at work, in jail) on behalf of gaining equality for all women. Overall, she is a strong and likeable character, but will make the reader feel anxious on multiple occasions. Paul, the male protagonist, is utterly romantic and chivalrous, but he is every bit as strong headed as Lilia. For me, his character was the easiest to like and relate to. Spending time with Lilia and learning about the suffrage movement causes Paul to question everything he has stood for and dedicated his life to. Impossible Saints is a smart and meticulously researched novel with a rich story of love, redemption, and resilience at its core. If you are curious about the social and political climate of the women’s suffrage movement in England, I highly recommend this novel as a great place to start.